What are the top reasons to use TicketFire? To digitize tickets so that you conveniently have your tickets with you on your mobile phone for entry to the event. To avoid last minute meetups and transfer tickets via text message or email to friends, family and others. The recipient does not need the TicketFire app to open the tickets. To quickly and securely sell tickets up to the last minute of an event. Simply take a photo of your tickets to list across numerous marketplaces as well as social sites such as Facebook and Twitter. What Devices Does TicketFire Work On? TicketFire is currently available for iPhone and Android smartphones, and online with the Ticket Manager platform. To get started, download and open the TicketFire iPhone/Android app and log in with either Facebook or your email and password credentials. If you do not already have a TicketFire account, click Create an account. You can also visit the TicketFire Ticket Manager site and create an account. How do I convert ticket(s)? App: First, click the blue camera button. Next, take a picture of the entire ticket. Make sure the event information and barcode on the ticket are clearly visible in the picture. After you’ve finished capturing photos of your tickets, click Done. Ticket Manager: Click on "Add Tickets" and upload ticket information. Easily convert hard tickets to PDF and mobile tickets. How long does it take TicketFire to create the digital ticket after it is submitted? Using TicketFire’s advanced, patent-pending technology, it typically takes less than five minutes for the digital ticket to be securely created. On the app’s home screen, click the Tickets button and your ticket(s) should appear shortly. 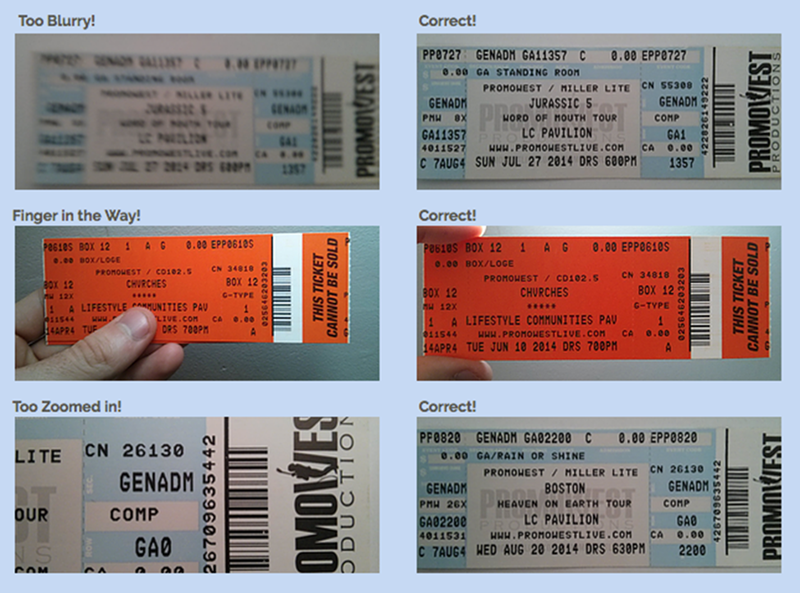 What does a correctly scanned ticket look like? What happens if my ticket fails to upload? If your ticket fails to upload, this could be the result of poor image quality, lack of necessary details on the ticket, or an invalid ticket. We encourage you to check that the ticket is valid then retake the picture, ensuring that all the important information is captured. This information includes: event name, venue, date, and section/row/seat number. How do I find out why my ticket failed to upload? Click the alerts icon in the top left of the screen to gather info on why your upload failed. How do I buy a ticket from TicketFire? Go to the TicketFire website or the TicketFire app for the complete set of events and tickets available. Search by event or discover upcoming and trending events. How do I receive tickets bought from TicketFire? After finalizing the purchase, TicketFire will send you an order receipt and an email confirmation of the purchase. Depending on the ticket format accepted at the event, TicketFire will attach your tickets as PDFs to print and/or add the mobile versions of the tickets in your TicketFire app. Different statuses show depending on the type of ticket you have, like mobile, UPS, electronic, Instant Download, or pick up. To find info on your order in the mobile app, go to Buy Tickets and then click the menu icon in the top right. Find the delivery details for your orders by choosing My Tickets. To find info on your order on the TicketFire website, go to Login in the top right and click My Purchases. After buying & receiving a ticket, what ticket format should I bring to the event? You should take both the mobile ticket and the PDF ticket to the event. TicketFire has been used successfully in over 3,000 venues around the world; however, there is a fair amount of change currently taking place with the types of ticket formats each venue accepts. Therefore, we highly recommend that you bring a PDF print out of your ticket(s) with you as a backup, in case the venue does not yet accept the mobile ticket version. TicketFire expects the sellers who list tickets on our Exchange to provide the seating they advertise or else provide equal or superior seating. Sellers are expected to contact customers proactively to confirm any significant seating changes vis-à-vis the initial section and row of a ticket order. Customers should contact TicketFire ASAP if they are unhappy with any alternate tickets and we will investigate the issue for the customer in order to reach an amicable conclusion. All deliveries are made to the address listed by the purchaser in the appropriate textboxes during checkout. We guarantee that the tickets will be shipped to the purchaser in sufficient time so that at least one delivery attempt is made before the event occurs. Please note that the purchaser is responsible for making himself or herself available to receive delivery of the tickets when a delivery attempt is made. TicketFire will coordinate with the ticket seller for compensation in those cases when sellers do not ship or do not otherwise deliver tickets in time for customers to access them for the event. TicketFire will coordinate with the selling broker to provide the purchaser a full refund of the ticket order excluding delivery fees in situations where the event has been permanently cancelled. Please note that the ticket seller may require the purchaser to return the tickets prior to issuing a refund. Should any of these not occur, we will replace tickets with comparable or better tickets to the same event, or offer a full refund or credit for a future purchase. TicketFire utilizes a rating system that ranks the sellers who resell tickets through our Exchange based on past order behavior and purchase efficiency. We use this system to ensure that our customers are treated as responsibly as possible by the sellers in our network. We expect the very best service for our customers and constantly review ticket sellers in order to ensure they provide the best possible service! The rating system detailed above individually assesses each ticket seller and calculates hundreds of behaviorally-triggered touch points on a recurring basis. The ratings for ticket sellers are therefore constantly in flux and constantly updated so as to ensure consistently superior service for TicketFire customers. We at TicketFire reserve the right to limit the rights of sellers to sell tickets through our Exchange in response to any customer service situation. Penalties in this regard can range from fines imposed by TicketFire to outright exclusion from our marketplace. Sellers therefore have every incentive to treat our customers with respect. You’re always protected when you order through TicketFire! What types of event tickets can be sold through TicketFire? There are some types of tickets that TicketFire doesn’t currently support for the sell function (i.e. Flash Seats). If your ticket is one we do not support, you will receive a notification. How do I sell a ticket with TicketFire? First, open the TicketFire app and digitize the ticket(s) you would like to sell. After the ticket(s) has been processed, it will appear in the upcoming tab of the Tickets section of the app. Choose the event and click Sell and then select the applicable tickets you’d like to list. Choose Sale Method, Grouping, Pricing, Payment Method, and add a credit card to verify your sale. Click Next and read/accept the terms and conditions. Your sale is now active! You are able to edit the price of the sale or cancel the sale under the For Sale section of active sales. How do I post a ticket sale to social media? Using the same process mentioned above, select Sell on Social. Continue the process until you have reached the final screen. You may now choose to post the ticket sale on Facebook or Twitter. You may also choose to post the ticket sale in specific groups on Facebook or Twitter. If I’m the seller, how do I receive payment? TicketFire offers two methods by which the seller can receive payment – Venmo or PayPal. The seller must have an account in either Venmo or PayPal to finalize the sale. The seller must then input the username of the account. To ensure the integrity of the sale of the ticket, and to prevent fraudulent sales, the seller will receive payment five days after the event takes place. What if I want to cancel the sale of my ticket? Select the tickets under the For Sale tab of the app, click on the listing and choose Cancel Sale. Am I guaranteed a sale of my ticket? TicketFire will use our patent-pending technology and our best efforts to sell your ticket, but we cannot guarantee that your ticket will be sold. Should your ticket(s) sell, you will be notified promptly. What is the fee when selling a ticket through TicketFire? TicketFire receives 9% of the total ticket sale price. How do I transfer a ticket to another individual? In Tickets, select a ticket and then click the share button in the top right corner of the screen. Choose which action you would like to take from the list. Next, select a recipient from your contacts or simply enter the name and mobile number of the person you are transferring the ticket to – TicketFire will then create a claim code and send a text message to the designated ticket recipient. How do I claim a ticket that has been transferred to me? As the ticket transfer recipient, you will receive a text message displaying the email of the person who sent you a ticket through TicketFire. You can open the ticket in the TicketFire app, or you can click the hyperlink found in the text. If you click the hyperlink, you will then be prompted to enter the last four digits of your cell phone number in order to unlock the ticket. After that, you are free to use your ticket right away. Will I be able to get in to the event? Yes! The barcode works with all the major ticket scanners (e.g. Ticketmaster, Eventbrite, Tickets.com, and more! ).